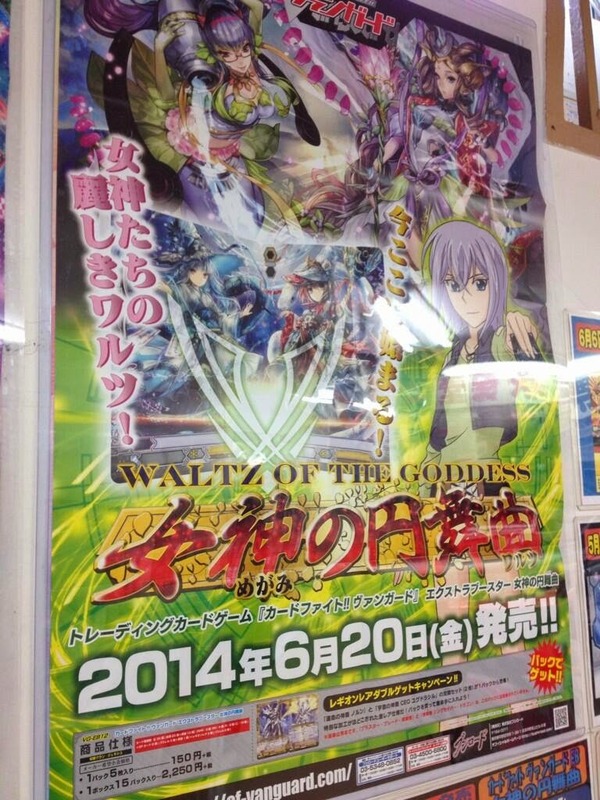 Information regarding the upcoming Cardfight!! Vanguard films has just come out of this year's ongoing Great Vanguard Festival. Previously revealed at Bushiroad's December 2013 press conference, the films are currently scheduled for dual screenings as a single movie in September 2014. The first piece, A Game of Three (３つのゲーム Mitsu no Geemu) will be filmed in live action and star musician-actor Naito Daigō, while the second movie, Neon Messiah (ネオンメサイア Neon Mesaia), will be animated by LIDENFILMS of Ultra Super Pictures and star professional seiyuu Yonaga Tsubasa as the voice of Sendou Aichi. LIDENFILMS had previously done animation work on the franchise's poorly-received second season, Asia Circuit. Neon Messiah is set to take place between the end of the Link Joker and the currently airing Legion Mate chapters of the anime series, and will explore the events leading up to Aichi's disappearance in the latter season. Also coming out just today is news regarding the sixteenth and seventeenth Japanese trial decks, leaked by the manager of the Fukuoka-based card store G-PROJECT. VG-TD17: Blue Flames of the Sacred Court (聖裁の青き炎 Seisai no Aokihonoo alternatively translated as of the Sacred Judge) will feature the Gold Paladin units used by Quatre Knight Olivier Gaillard, but the exact nature of TD16's support is not known. TD16: Cursed Dragon of Determination (決意の呪縛竜 Ketsui no Jubakuryuu) has been widely speculated to contain support for the Link Joker clan, based on the use of the kanji 呪縛 Jubaku "curse/spell" which is also the written form of ロック Rokku Lock. Without a pronunciation guide, it's uncertain if the intended reading is Cursed Dragon or Locked Dragon; the double meaning may be intentional. According to G-PROJECT, both decks will be receiving a Beginning Set variant as with TD14 and 15, and will be released on July 11th. In other news, the decklists from the Petit Vanguard Festival's winning team have been made public and are translated below. Captained by Sussan using a Dragonic Nouvelle Vague deck, the team also features one of the first successful Monarch Sanctuary builds of the BT15-on format; Monarch has had a generally lukewarm reception in Japan, debuting on the secondary market as a 200 yen (approx. $2) RRR, and even in the team midfielder Chris' deck Monarch himself is only played at two copies. Much of the build's newfound success comes from Balan, an improved clone of Barrier Troop Revenger Dorint that can unflip damage whenever a Blade Liberator is called to the rearguard, and from Star Rain Trumpeter, who can superior call a unit by returning Blade Liberators to the deck from the drop zone or soul. The new grade 1 Zorron is also subtly important to the new Liberators; when called to the rearguard from the deck Zorron can move into the soul to call another card from the top 3 cards, so that with the skills of Gancelot Zenith, Star Rain and Escrad all able to trigger him, the Monarch build achieves effective acceleration that can partially ignore Zorron and run a "46-card" deck while also replenishing the soul for Monarch's limit break. Chris' version of the deck also has synergy with Gancelot Zenith's emphasis on grade 2 and lower rearguards, achieved by running just 6 grade 3s. A tremor is running through the professional Cardfight!! Vanguard community as allegations of cheating have surfaced in the aftermath of Team League 2014's Paris regional. Although his team did not make first or second place in the tournament, reigning world champion Almeida Stewart has been accused of stacking his opponents' decks during the elimination rounds and in the top 8. The story has been corroborated both by several of Stewart's opponents in the tournament and by a personal acquaintance of his. On-site judges have allegedly confirmed the story after reviewing a video of his gameplay, but the video has not yet been made public. Photo of Stewart from January 2014. According to a source who has requested to remain anonymous, Stewart has been stacking constantly since he began playing, even in non-tournament casual games, and as a result his techniques for stacking decks have become nearly imperceptible. He made a habit of trying to find ways to accuse other players of breaking the rules to put them at an unfair disadvantage, in one example telling them that they could not stand their units after they mistakenly conducted their draw phase before their stand phase. According to our source, the statement "If you cheat, cheat good" attributed to him by those that attended the tournament, has been a common saying from him throughout his career. The allegations disturb the legitimacy of Stewart's title and potentially that of the World Championship, which has experienced problems with its on-site judge training program and spotting cheating from the beginning. Cheating is a regular hazard in the world of professional play and developing methods to prevent it has been a constant concern, but it has not been seen on such a grand scale since Kanamaru Makoto was issued a two-year ban from playing in tournaments because of marking his cards back in 2012. Kanamaru's sentence expired just last January. The world's eyes are currently on Bushiroad International, waiting for the video evidence to be released, and for a final conclusion to be drawn on his guilt or innocence. EDIT: A followup story has been published. The first stage of Team League 2014: Invasion concluded in Paris yesterday, with first place taken by a team from the Netherlands. 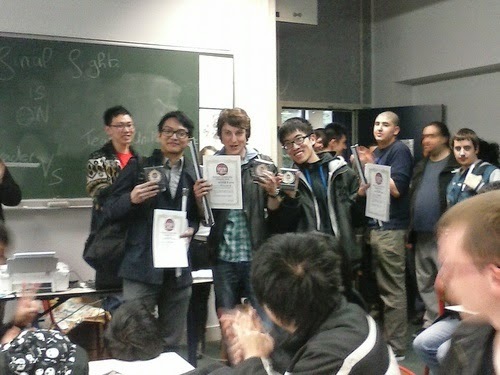 39 teams took part in the regional qualifier, numbering 117 persons in total, with a native French team placing second. According to eyewitness accounts the French team was in the minority of those playing Invader side of the tournament; Team League 2014 is divided into two halves according to its special rules, the Cray Defenders and Void Invaders, and depending on which force a team chooses to side with they are restricted to either being unable to use Link Joker and "Яeverse" cards or are required to use them in their decks. Following the announcement that Extra Booster 9: Divine Dragon Progression will be getting an English release midway through the Team League tournament, many teams have preemptively chosen to side with the Defenders in anticipation of Dragonic Nouvelle Vague's sweeping effect on the format. In spite of Chaos Breaker Dragon's upcoming release in BT13: Catastrophic Outbreak within the next two weeks, this has ironically left Void understaffed. The first place team, United Force, was led by a Gold Paladin cardfighter playing a Liberator deck that combined Liberator Alfred's topdeck superior call to fill the field with a massive field power bonus from Gancelot's break ride skill. Middle and rear positions were played by Shadow Paladin and Eradicator cardfighters, with the self-standing Raging Form Dragon as the marquee card of the Shadow Paladin fighter's Revenger deck. 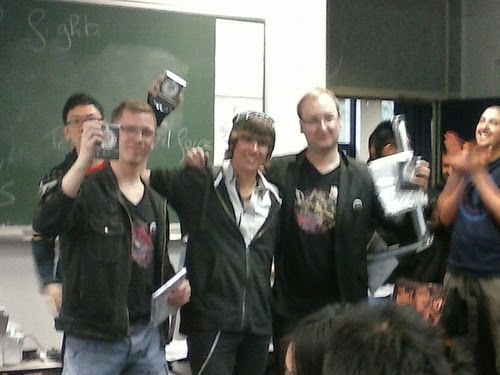 Second place team SKET played Luquier "Яeverse," Nebula Lord Dragon and Vowing Saber Dragon "Яeverse." The regional qualifiers for Mexico and Canada also took place on the 19th, with their results currently forthcoming. The latest poster leaks from Japan have named both VG-EB11: Requiem at Dusk's and VG-EB12: Waltz of the Goddess' dual cover cards, hinting at the identities of an anticipated quartet of new units for the Shadow Paladin and Genesis clans. Shadow Paladin's new Legion pair, Blaster Dark Revenger "Abyss" (ブラスター・ダーク・撃退者 “Abyss” Burasutaa Daaku Ribenjaa “Abyss”) and Revenger Phantom Blaster "Abyss" (撃退者 ファントム・ブラスター “Abyss” Ribenjaa Fantomu Burasutaa “Abyss”) are named after an epithet for the original Phantom Blaster Dragon, the "Abyssal Dragon" (奈落竜 Narakuryuu also given as "Dragon of Hell.") 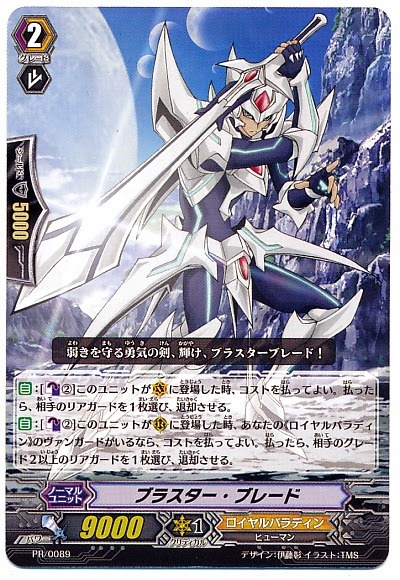 The Abyss motif had previously been used for the Revengers in TD10 where 奈落の撃退者 was translated as "Purgatory Revenger" and referred to that trial deck's break ride, Mordred Phantom. With Abyss-specific support expected to come out of the set along with the new Revenger cards, Blaster "Abyss" is currently set up to be the most supported Shadow Paladin boss in the clan's history, drawing simultaneously from four different subclans with its name alone. 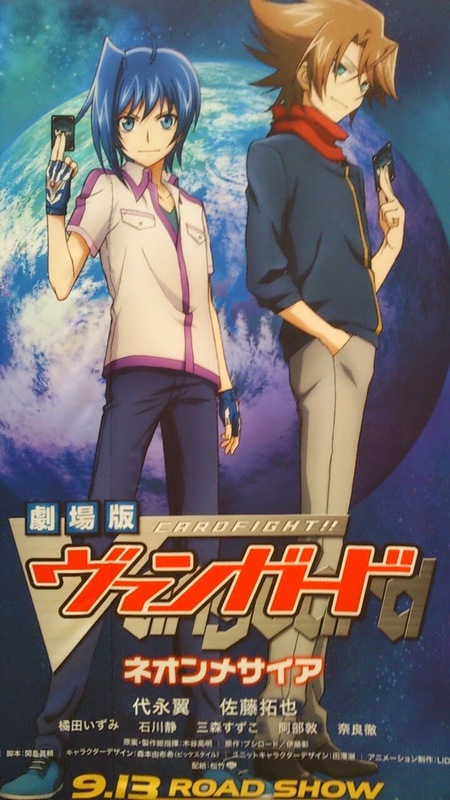 A similar poster for EB12 has identified that set's Legion pair as Regalia of Destiny Norn (運命の神器ノルン Unmei no Jingi Norun) and Regalia of the Cosmos CEO Yggdrasil (宇宙の神器CEOユグドラシル Uchuu no Jingi CEO Yugodorashiru.) The paired units draw their origins from Norse mythology, where Norn was the tripartite goddess of fate, and Yggdrasil was the world tree that Norse cosmology was built around. 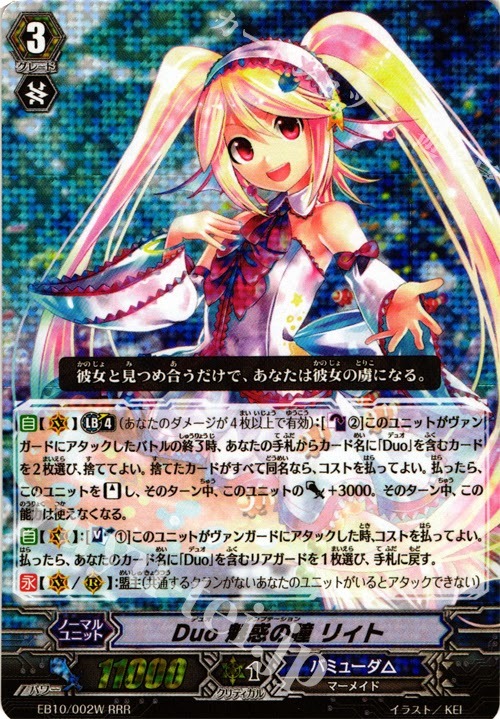 Yggdrasil has been previously named in Genesis' card lores as both the CEO of Genesis and a goddess of Neo Nectar, and has been implied to have some connection to Cray's own world tree. 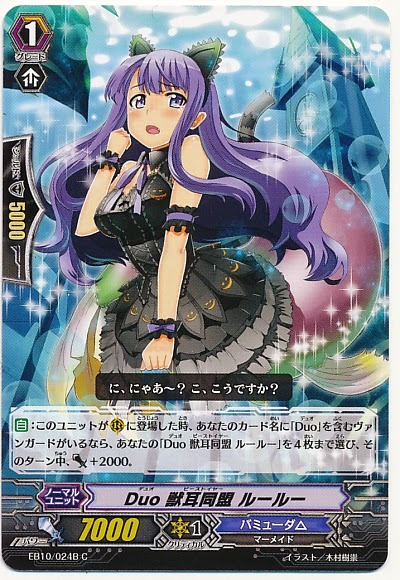 The character was previously alluded to in Jupiter's card lore and in the November 2013 issue of Monthly Bushiroad, where Yggdrasil was Genesis' CEO and working in secret with Hexagonal Magus, the acting head of Oracle Think Tank during Amaterasu's absence. In other news, the fan-run Second Petit Vanguard Festival (第二回プチヴァンガ祭 Dai-Ni-Kai Puchi Vanga Matsuri) team tournament has just concluded in Japan, with a team of Sacred Regalia, Monarch Sanctuary-Zenith and Nouvelle Vague cardfighters taking first place. The triples tournament was named after Bushiroad's ongoing Vanguard Festival events, humorously rebranding itself as the "Petit" Festival rather than the official "Great" Festival to distinguish between the two. 1 Dauntless Dominate Dragon "Я"
The Second Petit Festival represented the professional debut of Brawler and Seeker decks in Japan, the trial decks for which were just released yesterday. Although BT16 support is still a month away, the Legion abilities of Wingal Seeker and Skyhowl Dragon have proven sufficient to stand on their own in the new format. Notably, there were also no Eradicator decks in the tournament, and strong support for both Omega Glendios and the new Duo builds as competitors against Nouvelle Vague. Fighter's Spotlight is an ongoing project concerned with tracking real-world professional cardfighters across the globe. Almeida Stewart (far left) with Albert Lee, Adwin Leong and Kevin Lang. Original photo by Cardfight!! Vanguard USA. Almeida Stewart is the second Cardfight!! Vanguard world champion, having formally succeeded his predecessor Brandon Smith on January 12, 2014. Although originally celebrated at his ascension, subsequent cheating scandals disgraced his reputation as a professional cardfighter within the community. An eclectic player who had experience with many different clans, Stewart first made an appearance at the 2013 Belgium regional qualifier, taking first place with a Dragonic Overlord the End deck that would go on to be one of the mainstays of his emerging career. Stewart's qualifier had a turnout of 81 persons, which was relatively high for a European tournament but small compared to the size of regionals abroad. 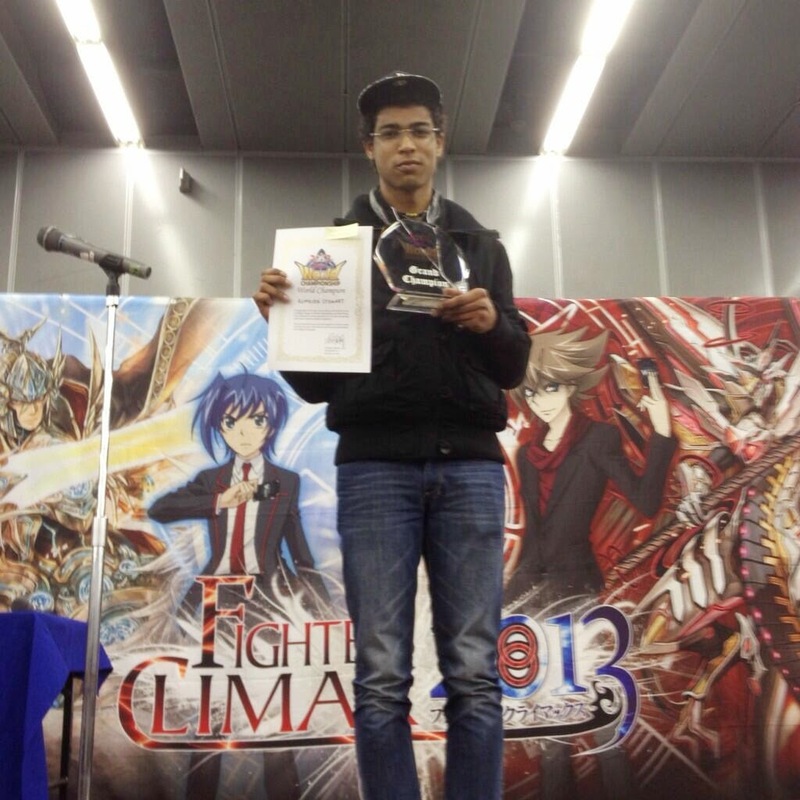 For the national finals he chose to play a Gold Paladin deck, coming out as the European national champion with using a Gancelot-Garmore Gold Paladin deck, and in the WCS2013 finals Stewart put Luxembourg on the map for professional play by becoming world champion with a modified Overlord build. As this was at a time when Kagerou had largely fallen out of favor in the international pro scene and was almost wholly replaced by Eradicator Dragonic Descendant, Stewart's decision to play a more deliberate DOTE than what had dominated in previous world championship qualifiers proved highly effective versus the rest of the world's top 8, then comprised entirely of Eradicator cardfighters save for one other player. Stewart made it to the top 2 with this other fighter, Albert Lee, who had been playing a Nova Grappler Beast Deity deck. Although the recordings of their games have not been made available to the public, Stewart achieved considerable fame for winning the world championship with an otherwise abandoned deck. Stewart also did well in underground play, placing first in the March 9th BeNeLux tournament, at the time one of the larger unofficial tournaments of the Belgium-Netherlands-Luxembourg circuit. In 2014 it came to light that Stewart was a repeat-offense cheater both in local tournaments and in professional play; individuals close to him came forward to Cardfight Pro with testimony against Stewart during the Paris regional qualifiers, and his fingerprints were later connected by the Luxembourg police with a robbery at card shop La Caverne du Gobelin on top of the existing accusations. Allegedly one of Stewart's personal mottos at the time was "If you cheat, cheat good," and he favored draw triggers on in his decks so that he could touch them more frequently to stack the cards. Video footage from the Paris qualifier supposedly proved him stacking his deck on stream, but this footage was turned out by the organizers to Bushiroad without being disclosed to the general public, and Bushiroad later denied its existence. After his team was connected to the robbery at La Caverne, Stewart formally apologized, returned the stolen merchandise, and was banned for life from the card shop. Bushiroad has never instigated a further investigation of Stewart, nor issued any sanction against him for his behavior. Stewart's playstyle was marked by a heavy overall focus on draw power, consistency and acceleration, as auxiliary support for his deck's core strategy. He once commented that he played four draw triggers in his Aqua Force deck "because Aqua Force only has four." He tended to favor trigger lineups that ran six draw and six critical triggers, and card changing units to exchange the draw triggers after he'd checked them. The Overlord decklist that Stewart won Belgium with is generally in line with the majority of DOTE decks being played in that era; by crossriding Dragonic Overlord the End over Dragonic Overlord, Stewart set up a base 13000 defense that allows standard 16000-power lines to be blocked with a single 5000 shield, while also creating a 21~23000 power vanguard line with either Embodiment of Armor Bahr or Flame of Promise Aermo. If the End's attack hit, his persona blast skill allowed him to stand for a +1 in card advantage and two extra drive checks, which in combination caould snowball into a high-power, high-critical vanguard line. The real value of the End during this era was its status as a "pressure unit" that forced the opponent to drop more defense than normal, as DOTE could absolutely not be allowed to hit in the minds of Stewart's opponents. The intention of the deck is thus not necessarily to use DOTE's persona blast, but to drop more cards than normal from the opponent's hand to prevent the on-hit skill where otherwise they would simply no-guard the powerful center lane. The first vanguard Conroe allowed both Bahr and Aermo to be searched effectively, while Gattling Claw Dragon controlled the opponents' first vanguard and built additional soul for Flame of Promise's soulblast. As Kagerou's damage unflipper, Bellicosity Dragon kept the damage zone open after using Conroe or Berserk Dragon's field control skill, to keep threatening the opponent with DOTE's persona blast. At endgame when it was certain that there was no more room for the vanguard to hit, it was then possible to use a rearguard Dragonic Overlord's counterblast 3 as a finishing move, with a rearguard in the range of 23000 power either crippling the opponent's frontrow while also dealing damage to their vanguard or draining their hand sufficiently that the game would end that turn. The biggest difference between standard decks and Stewart's is the trigger lineup. Stewart chose to run additional draw triggers rather than critical triggers so that he would continually build card advantage while the opponent lost it from defending DOTE, and he would then use Gojo or Flame of Hope to card change out the draw triggers for more useful units. The use of Tejas to attack the opponent's backrow units is also unusual for an international deck where Nehalem as a base 10000 unit is more common, although it will appear familiar to Japanese cardfighters due to overall differences in unit usage. Running just four critical triggers did run the risk of running out of criticals entirely and losing out on one of the points that the End so threatening during this period, but that also requires the opponent to notice that there are only four critical triggers. This was also a period when some cardfighters were choosing to counter the End by not playing the mindgames he created at all and allowing his skill to go off early, guarding Bellicosity but letting the vanguard hit, putting them at higher damage to use for fighting back with limit breaks and leaving the DOTE fighter with a majority of their counterblast used up. Nevertheless, Stewart's strategy was brutally effective in Belgium and brought him to first place. For the European national championship Stewart chose to bring his Gold Paladin deck rather than make a repeat appearance with Kagerou, using the established Silver Wolf Garmore with the Liberator Gancelot break ride that had just come out in a recent trial deck. At the time the international release of VGE-BT10: Triumphant Return of the King of Knights was delayed, having had its release date been deliberately staggered in time for the Christmas season, and instead BT11: Seal Dragons Unleashed debuted ahead of schedule. So while Stewart could have modified his Overlord deck using the Dauntless Drive Dragon break ride from that set, as many around the time of the European, Asian and North American nationals had been doing, he instead broke the trend to play Garmore. Stewart's Garmore build uses five draw and seven critical triggers, an uncommon count at the time that helps to secure his break ride setup with higher on average acceleration. 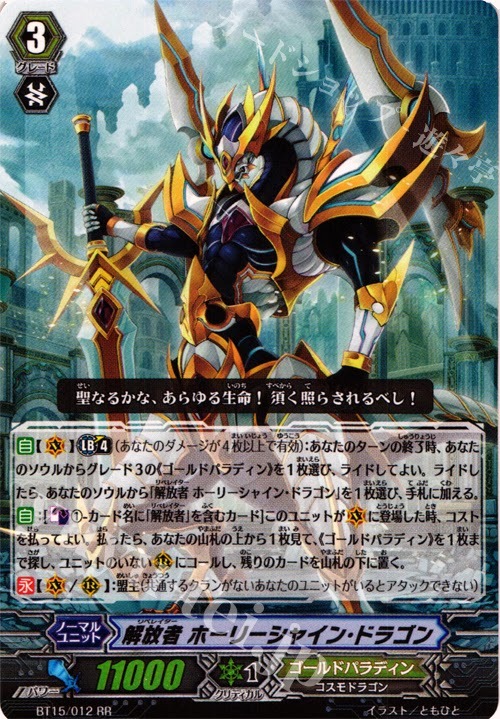 The deck's key feature is how it utilizes skill timing; Liberator Gancelot's break ride skill can give up to three Gold Paladin rearguards +5000 power, equivalent to riding a Soul Saver Dragon in Royal Paladin decks, but encounters the problem of having three rearguards on the field to power up. Since Garmore and Gancelot share the same timing of when Garmore is placed on the vanguard circle, Garmore's on-ride counterblast 2 can fetch a rearguard for Gancelot to power up, negating one of the major weaknesses of the deck while also breaking even in card advantage from dropping a second grade 3 to make the break ride take place. Garmore's ideal target is the grade 1 Dindrane, a base 6000 unit that when called from the deck can soulblast 1 to draw a card, playing into Stewart's advantage-based play style by effectively trading the extra grade 3 he puts down for a usable booster and then giving him another card in hand. Blaster Blade Spirit is also an important tech for the build, since Garmore can fetch Spirit and then use his on-call counterblast 1 to retire an opponent's rearguard, pushing the opponent down in advantage and making it more difficult for them to guard all three lanes which attack in the ballpark of 21000, 31000 and 26000 power. The build is also able to utilize Tripp to keep the damage zone open in the same way that Bellicosity was played in his previous deck, use Nimue and Viviane as early pressure units to convince the opponent to guard their counterblast 1 on-hit skills, and build base 21000 rearguard lanes using Charjgal with additional Garmore copies. Due to the original Overlord fading out of use, at this point crossride defense was becoming a negligible element of the format, and this helped the use of lower power rearguards like Dindrane and Viviane where previously base 12000 attackers had been the staple cards of any competitive deck. Although the public was uncertain of which deck Stewart would bring to the championship, by the time of the international finals he was deciding between either a modified Overlord or a Scarlet Witch CoCo-Battle Sister Cookie deck, and had traded away this Gold Paladin deck. For the championship finals Stewart built his own variation on Overlord, incorporating the Dauntless Drive Dragon break ride that by then had become well established in pro play. Several supporting cards expedite his previous strategy's consistency; while this deck runs six draw instead of eight, the new draw trigger Artpique helps him power up his rearguards to break 21000 power and strengthen his vanguard line where necessary. Seal Dragon Kersey generally replaced Gojo's role, since it could card change one of his draw triggers out just by being called as long as the opponent has a grade 2 in play. The game-deciding play for the deck is to break ride Dragonic Overlord the End over Dauntless Drive Dragon, forcing the opponent into a situation where there are no good decisions. Dauntless' break ride skill activates after the vanguard has attacked, allowing it to discard 3 cards to stand if it has not already stood that turn; the opponent is thus forced to choose between giving Stewart two vanguard attacks with a +1 from DOTE's persona blast or a -1 from Dauntless' skill, but if the first attack is defended then they also run the risk of the second attack connecting and triggering the End's persona blast. Earlier plays are made possible by break riding Dauntless over Dauntless, and the losses in card advantage are generally made up for by the draw-heavy focus of Stewart's build. The only safe counter is to no-guard the first attack and allow the persona blast to activate so that no more skills will activate that turn, but from a more pessimistic perspective this means that the safest play is to allow the End's skill to activate and improve Stewart's position. Stewart surprised the professional community in early March by taking first in a BeNeLux tournament using an Aqua Force deck unrelated to his established builds. By using Penguin Soldier in his deck he achieved a similar level of acceleration and consistency to his other decks with its on-call draw skill, and because of his deck's focus on break riding over Transcore Dragon he generally has the 4 soul necessary to use two Penguin Soldiers per game. The core of this deck uses the Ripple evolution cards for ride security to search out Pavroth or Genovius, with the grade 1 and 2 Brave Shooter support for base 10000 and 12000 attackers that allow early aggression. This also works well with Pavroth's ability to stand and power up a rearguard in the midgame, turning Twin Strike Brave Shooter into a base 15000 attacker on the second strike. Similar to contemporary break ride-based decks, Stewart's main strategy is to break ride his main grade 3 Genovius over the supporting Transcore Dragon; attacking with both rearguard lanes first brings the opponent to 5 damage, Transcore's skill forces the opponent to discard a card just to be able to guard Genovius in the first place to ensure a -3 even if they have a perfect defense card, and Genovius' persona blast stands both rearguard columns to ensure two more attacks waiting to receive any following trigger checks. The maneuver becomes even more dangerous if the opponent is already at 5 damage, where any one of the five attacks can win the game. For endgame purposes Stewart runs a tech copy of Blue Storm Supreme Dragon Glory Maelstrom, using Glory Maelstrom's ultimate break to prevent the opponent from guarding with perfect defense cards while increasing his own power. The decision synergizes well with his focus on draw power and grade security, where it's easier to acquire tech cards towards the end of a fight, but the build's synergy is hurt somewhat by the lack of card changing to drop Sea Otters for other units. 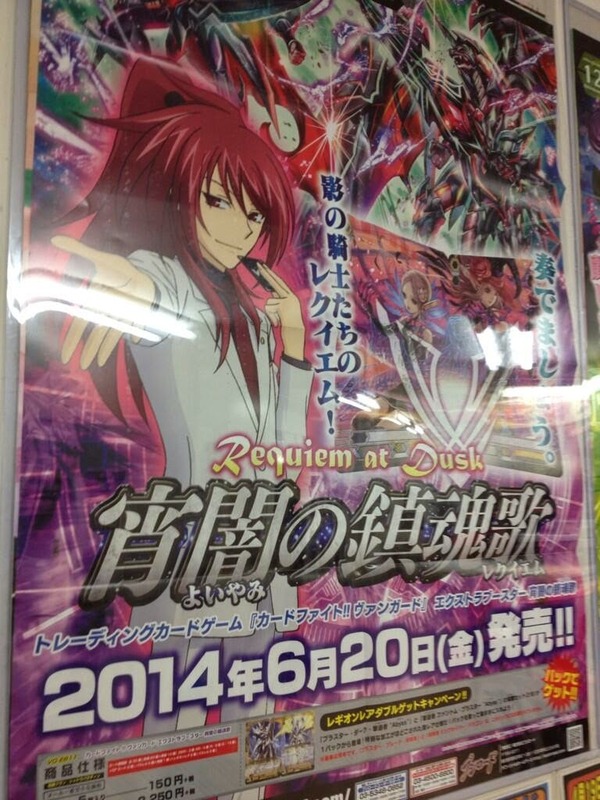 After several years of anticipation, Itou Akira's long-awaited Cardfight!! Vanguard manga will finally be reaching western shores at the end of this month. Vertical Inc.'s English translation of the Cardfight!! Vanguard manga will come in two variations, both of which are 220-240 page paperbacks that come with an alternate artwork print of Blaster Blade using Studio TMS' artwork PR/046EN. The Special Edition will also come with two 25-card Flash Fight decks, a playmat and storage box. The Special Edition of volume 1 is limited to 4500 copies, of which 2400 were already ordered by the beginning of March, and only first edition prints of the manga will contain the promo card. The Japanese print of this Blaster Blade promo is visible below for comparison. The Cardfight!! 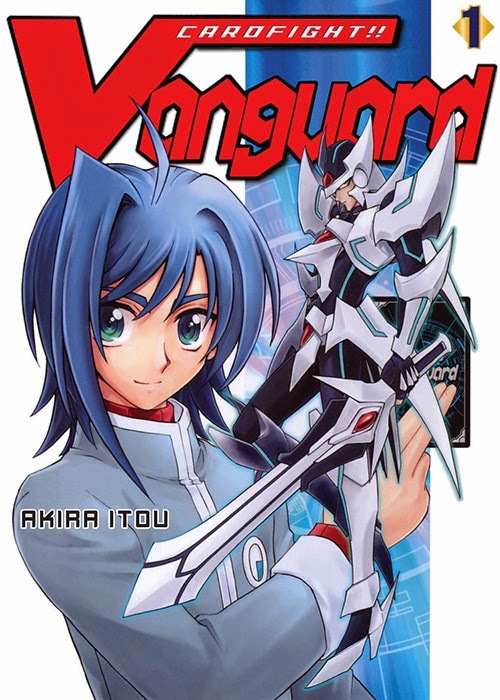 Vanguard manga is highly regarded in the community for having a more cohesive take on the franchise's storyline, being written without the same time restrictions as the weekly anime and with less product placement; unlike in the animated series that models its narrative around upcoming booster sets, cards in the manga are created to tell a story first and made into reality later. Itou's writing acts as the source material for many ideas used in the anime and light novels, but instead of diverging into tournament arcs and championships, his manga gives focus to the daily lives of the cast and personal pressures they face. Both versions of volume 1 are available on Amazon, although it should be noted that Amazon's listing erroneously lists the Special Edition as hardcover. Volume 2 is currently slated for a June 24th release, and volume 3 is to follow on August 26th. The promo cards for those volumes have not yet been announced, but it's feasible that they may follow the trend set by the first card have the next two contain Studio TMS' alternate artworks for Dragonic Overlord and Blaster Dark. Itou's manga first appeared in July 2010 at the Tokyo Toy Show, with the first pages of the manga being previewed alongside an early PV for the first season of the anime. The manga began its formal Japanese run in KeroKero Ace magazine in November of the same year, where the first chapter was serialized ahead of the anime (which would not begin airing until January 2011), and the second chapter followed in December. Itou's manga continued to be serialized chapter by chapter in KeroKero Ace for three years of unbroken publication, until the magazine suddenly collapsed in July 2013, due to an executive decision by the publishers, Kadokawa Shoten. 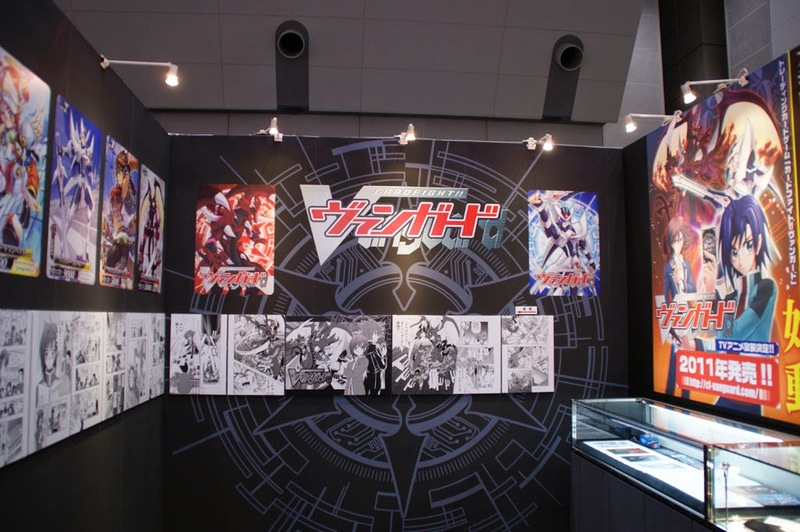 In September the manga switched publications to the newly-created Monthly Bushiroad magazine, and has continued to have new chapters printed every month since that time. Thus far seven volumes have been compiled from Itou's chapters, with volume 1 originally being released in March 2011, volume 2 in August of that year, volume 3 in January 2012, volume 4 in June, volume 5 in November, volume 6 in August 2013, and most recently volume 7 in December 2013. The English-language volumes so far follow a bi-monthly schedule, and at that rate could be forecasted to catch up to the Japanese volumes by April of next year. Higashiōsaka Civic Center, Higashiōsaka city, Osaka prefecture. Image source. The last Vanguard Championship of March ended on the 30th, with the Dragonic Nouvelle Vague making an encore appearance in the Second Kansai VGCS' first and fourth spots. Turnout at Kansai almost broke 100, reaching a latent high point of 97 persons, although it was planned to accommodate up to 128 participants. Kagerou made up an overwhelming majority of the tournament with 42 entrants, but in spite of this dominance Kansai became the staging ground for Bermuda Triangle's revival in the Japanese pro scene, being tied with Aqua Force for the fourth most represented clan. Just over a week after the release of VG-EB10: Divas' Duet, third place in the Kansai CS was taken by Kimuti, playing Duo Temptation Ried. Based on early previews of the cards in Monthly Bushiroad magazine, Duo builds were expected to do well in competitive play, but there was some debate over whether Ried or Iori would be the preferred deck in the current format. Where Ried is a self-standing vanguard like many of the currently favored decks, Iori's limit break allows her to search for up to two copies of any card in the deck as long as she already has one in play, forcing Duo fighters to choose between an offensive swing that can end the game or unparalleled access to the deck. 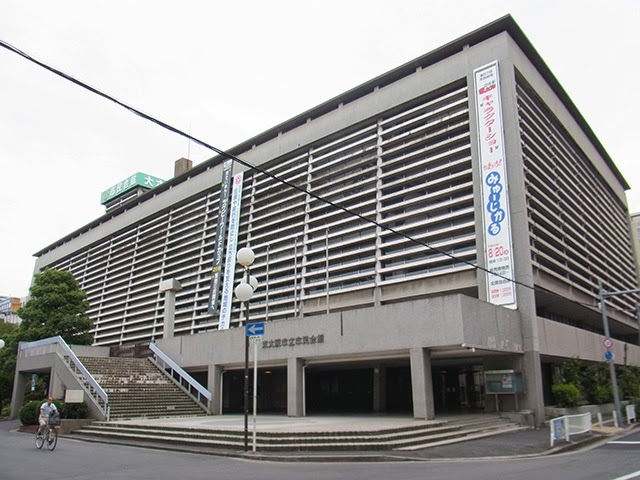 The tournament had an entry fee of 1000 yen per person, and was held on the third floor of the Higashiōsaka Civic Center in Osaka prefecture. The tournament lasted from 11:20 AM until 7:30 PM, and had six 20-minute best-of-1 Swiss rounds followed by a cut to top 8 with four 50-minute best-of-3 games. First place won a Nintendo 3DS XL, second place a standard Nintendo 3DS, third place three boxes of VG-BT15: Infinite Rebirth and fourth place two boxes of the same. 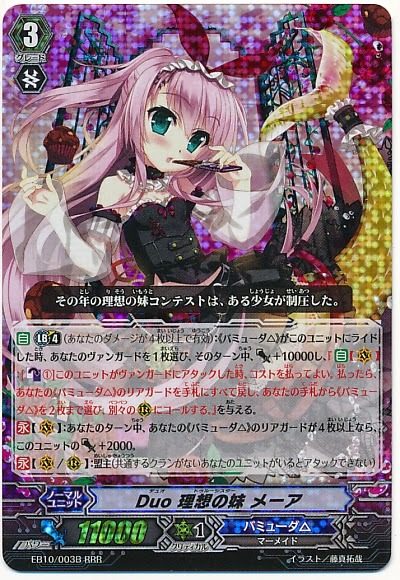 The deck's cornerstone play is using the Duo break ride, True Sister Mare, with its self-standing vanguard Ried. 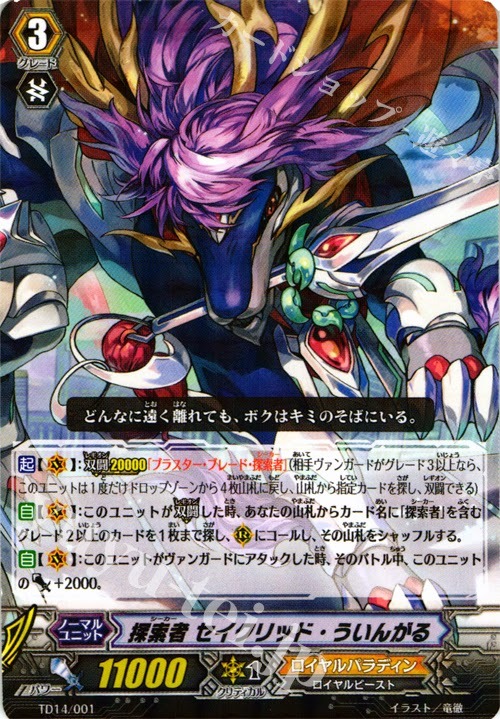 Like the previous Dragonic Descendant, Ethics Buster "Яeverse" and Dragonic Overlord "The Яe-birth", Mare into Ried has the inherent advantage of the break ride power multiplying the effectiveness of multiple attacks, but Mare's counterblast 1 also returns all Bermuda Triangle units to hand when the vanguard attacks and then calls two. When used in combination with Ried, who can stand herself by discarding two Duos with the same name and paying 2 counterblast after she attacks, this allows for six attacks in one turn. The calling of rearguards also provides more opportunities to use Loulou in combination with the clan's base 12000 attacker Syrdarya, and Ural. Like Nouvelle, one of the key points of success for the Ried build is its access to a Luck Bird equivalent in Duo Pretty Horn Ural, and Kimuti chose to run Ural at four to capitalize on Duo series' efficient one-girl soulcharging engine, Ricca. By being able to grab up that kind of cheap card advantage throughout the fight, compensating for Shizuku's failure or building on her success early game, then making additional plays over Ricca's soulcharging after using skills that return her to hand, Duo decks are able to effectively accelerate in a way that makes every one card count for two. Adding to its effectiveness is that the deck has a special booster in Duo Beast Ear Loulou, a base 7000 grade 1 that when called can choose up to Loulous on the field to give +2000 power to. Since Bermuda Triangle makes its plays around being able to return cards to the hand, she can be safely recycled across multiple turns, and at endgame when multiple Loulous hit the field the first one played becomes successively more powerful than those that follow, so that the backrow begins to look like 13000-11000-9000 or 13000-9000-11000 to make strong rearguard lanes that complement a high-power vanguard. Also of note is Demon King's Glendios deck, in second place. While Glendios was previously established at the third Laketown, second Tsurumai and eighth Battle City tournaments as an effective deck in its own right, King's build deviated significantly from the established norms. Most Link Joker cardfighters run Glendios with thirteen grade 3s and seven grade 2s to make use of nine “Яeverse” cards, but Demon King's build instead cut back to eleven grade 3s with seven “Яeverse” units in favor of an additional Colony Maker and Rubidium, prioritizing Colony Maker's ability to search for Ruin Magician and streamlining how the “Яeverse” units are played. This is in contrast to Nao and Kuroneko's Glendios decks from further down in the top 8, which played sixteen and thirteen grade 3s respectively, and experimented with Infinite Zero and Cold Death Dragon to pursue Glendios' ultimate break instead of winning conventionally. The VGCS tournaments are a series of unofficial tournaments organized by fans and cardshops. Unlike Bushiroad's larger official tournaments, most VGCS events are done using a best of 3, Swiss tournament model. Turnout is typically 70-80 persons, but some events see 100 or more participants, all of whom compete using pseudonyms and internet handles rather than their real names as in official events. In other news, the official website for Cardfight!! Vanguard Lock on Victory!! has updated with new information regarding the upcoming 3DS game. According to the newly established story page, there is a separate storyline for each of the three in-game high schools, with each character responding differently depending on whether the protagonist is male or female, and there are multiple endings depending on both the choice of school and character. Building on the previous game's feature of being able to start the game over with the same card collection after completing it the first time, Lock on Victory takes full advantage of the system by letting them see each of the different storylines across multiple playthroughs.